Are you tired of having to get out a knife, peel back the wrapper, throw away the wrapper, and wash the knife, every time you need a slice of sweet, creamy butter? So much work! There has to be a butter way! This little oinker happily stores and dispenses your butter, keeping it fresh and air tight, and easily slices off a pad whenever you get the craving. Just twist its curly tail. As a bonus, it also includes two extra attachments to extrude butter or margarine. * Stores one stick of butter. Pass it around the Thanksgiving table, so each of your guests can grab a slice of pure, sweet butter. No more fussing with a complicated dish, or losing track of the butter knife. Butter tastes great on rolls, toast, garlic bread, croissants, corn, mashed potatoes, pancakes, noodles, broccoli, Brussels sprouts, carrots, biscuits, bacon, and more! *When using the extrusion attachments, leave the butter out of the icebox to soften for an hour first. Why not print a Butter Pig for your loved ones this holiday season! Makes a great stocking stuffer!! Edit 11/26/14 – I’ve uploaded a new set of extruder attachments that are slightly thicker so the butter won’t ooze out the edges. Also a new full plate STL with the updated extruders. 1/6/2015 – #IceboxChallenge winners have been announced! Butter Pig took 3rd place! https://firstbuild.com/blog/post/icebox-challenge-winners/215/ Pics of the winning designs at CES. Looks like they printed two of each, in orange and gray. 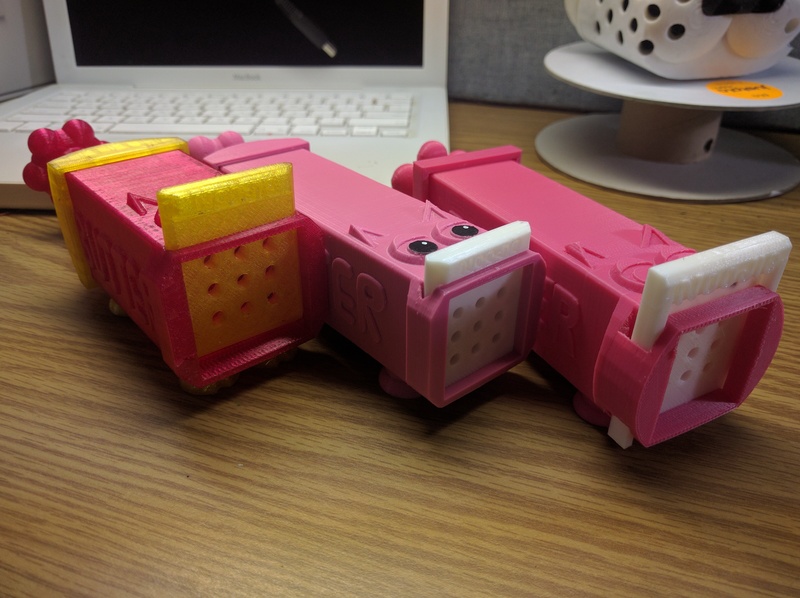 You can see the pigs in the middle here: https://twitter.com/makerbot/status/552517008051679233/photo/1 12/15 – I uploaded a new ‘half pint pig,’ perfect for those of you with smaller printers, or if you’ve just got a half stick of butter. Also added a ‘laid-down’ file, so you can try that if you have issues printing the standing-up one. 12/19/15 – I uploaded individual STL files for the half pint pig tail and body. Let’s see some pictures of your Butter Pigs!! !